What secrets do the three towers hold? For years travelers have avoided the mysterious kingdom of Afranor. There are whispers of a lurking evil and fearful tales of a malevolent sorcerer with hideous creatures to do his bidding. Necessity, though, requires three brothers, the valiant fighting princes of Alinvayl, to pass through Afranor’s dark, forbidding expanse. Not all will survive the journey, but one may unexpectedly find his destiny. First, however, the mystery of the three towers must be solved and, more importantly, their supernatural challenges must be braved – and survived. 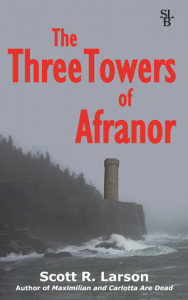 The Three Towers of Afranor is a fantasy novel by Scott R. Larson, author of Maximilian and Carlotta Are Dead. This is a story that I first conceived as a teenager when my mind was consumed by J.R.R. Tolkien, Marvel comic books and the TV series Dark Shadows. It began life as a story, written in Spanish, for a high school class. For years after, I revised and rewrote and expanded the story. It came alive again years later when I reinvented it as a bedtime story for my daughter. Now a teenager herself, she encouraged me to update it yet again. It is full of all the things that I enjoyed as a young reader: action, adventure, magic, danger and a bit of romance. This version is also infused with my experience of living for several years in the west of Ireland in a landscape of medieval castles and towers. My main protagonist, Prince Chrysteffor of Alinvayl, is a callow 19-year-old who does not think he is cut out to be a warrior like his older brothers. I was interested in exploring how a young man struggles to find courage within himself when circumstances require it but he has never had the occasion to feel brave before. He becomes smitten with a foreign princess named Eilis who is by far a fiercer and more experienced warrior than himself. When he becomes her only hope for survival, he has to find a way to face terrors and challenges way beyond anything in his worst nightmares. I think the arc of his development is something that most of us can identify with as we all face tests and challenges in our lives. Aon Fhear did not smile or show any emotion. "Prince Chrysteffor, I am the one who is grateful to you. You have done more than any man to liberate my land from the curse under which it suffers. This would be remarkable for any man of Afranor, but you are not from this country. Whatever happens now, I have no doubt that your name will be remembered–indeed sung–for generations. But enough talk. It is only delaying us. I am eager to have this over. In the short time we have known each other, the bond we have formed is such that we do not need a lot of words to know what is in each other's heart. Let us wait no longer. Let us go and fight evil." Chrysteffor nodded grimly, and Aon Fhear nodded in return. Then, with no further hesitation the blond man stepped inside the tower. The black-haired man followed immediately. And as quick as that, the inky darkness within had swallowed them up.